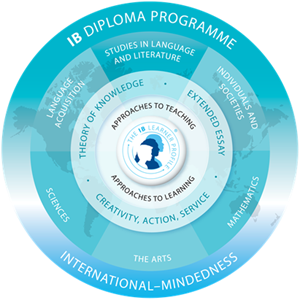 The Diploma Program (DP) is a two year programme for students aged 16 to 19 and is designed to not only prepare students for study at leading universities around the world but to also develop students who are critical and compassionate thinkers, lifelong learners, and responsible global citizens. The program is designed for highly motivated students willing to take on the challenge of a rigorous academic, global-minded program, which does not confine studies to the textbook, but extends it to practical applications. achieving high academic levels of performance. complete three unique, compulsory components of the curriculum called the Diploma Programme Core.